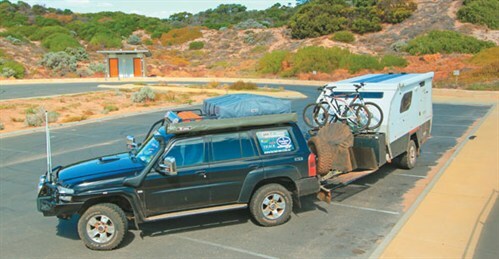 Setting up a long term tourer is a complicated and ongoing business. So to get ready for our year-long 'big lap' of Australia we needed to modify our Track Trailer Topaz camper trailer - so that it perfectly suited our travelling needs. If you are not familiar with the Topaz, it is like a bigger Tvan .It has a similar go-anywhere ethos, but is combined with caravan comforts. While flexible bedding (king, queen, singles or a bunk option), multi-positional table, inside or outside cooking, easy deploy awning, 80L fridge/freezer and on board hot water make it easy to live with straight from the factory, we have made a number of modifications that have really enhanced it as a long term tourer. www.campertrailers.org and Collyn Rivers' The Camper Trailer Book. We listed our electrical devices, estimated the current draw per item (amps),estimated hours of use each day and summed the values to get the total daily amps we required. The real fun began when calculating how to replenish our energy using solar, for when we would not have access to mains power or the alternator. Estimating solar power generation is a tricky business. There are so many variables - panel size, type,efficiency, cloud cover, temperature and peak sun hours. To make things more complicated, the rating of panels is a little misleading. Panels are rated at peak power which is often generated at voltage that is not usable, such as a 120W panel which generates at 16.5V. When measured at 12V, the power is around 75-80% less. So multiplying panel sizes by 75% gives a more accurate idea of energy generation for 12V applications, in ideal conditions. After messing around with spreadsheets and estimates for a few weeks, we had a chat with Jamie Hazelden from Dynamic Solar Solutions, who recommended the Red arc Battery Management System(BMS), BMS1215. This system features a display showing inputs and outputs in real time and battery reserves for each hour and day over the last 30 days, which we used to audit the camper's electrics. Switching on each item one at a time, and then together,it quickly provided a more accurate indication of our electrical demands. Similarly, with our solar panels or generator deployed, we could see how many amps were being generated and how long it took to fully charge the batteries. Our most power hungry device is our 80L fridge/freezer, drawing 6Ah when running. In the warmer regions the fridge can run almost continuously, one of the problems with all compressor fridges.During extended stays in one spot, we planned to replenish this draw with solar panels, using the generator as a backup. So we went back to Dynamic Solar Solutions to discuss solar panels.Our preference was for permanently mounted hardware that wouldn't affect the Topaz's centre of gravity. Jamie sourced a pair of Unisolar PVL68 amorphous solar panels, super thin and weighing only 4kg each. They don't generate as many amps as a similar sized multi-crystalline panel, but perform better in the tropical zone,as increased temperatures don't affect the output. They were permanently mounted to the roof of the Topaz which meant they could charge the batteries back at camp while we were off exploring,whilst still being secure. The only trick is keeping them clean, as roof access is tricky when your camper sits on an off road, high clearance axle. Standing on the front storage box with a soft broom dunked in a bucket of water does the trick. The downside to this approach is that we must park the camper in the sun to generate solar energy, making it hot and making the fridge work harder. To help with this problem we got some CG earawnings to keep the hot sun off the camper's body, while the pop-top mesh enables airflow. Track Trailer added strips of aluminium tracking to the camper to attach the awnings, pegged a tan angle. For the colder months when peak sun hours are less, we had a chatto Generator Place. They have a great website or you can freecall to talk to a generator expert. With the Topaz sporting a 1200W Truma air conditioner, they suggested we get the Honda EU20, ratedto 1600W (2000W max) if we wanted to run the cooler or heater at remote locations. So far, the air conditioning has saved us in stifling hot conditions at El Questro, Carawine Gorge and Middle Lagoon near Cape Leveque. With the energy demand and replenishment side of things adequately addressed, it was time to look at how to store this energy. Twin Optima 76Ah yellow tops just managed to squeeze into the battery trays and while their storage capacity is smaller than some other deep cycle batteries, the Optima spiral bound coils recharge quickly, are vibration resistant and withstand deep discharges better than other types of battery, giving them a higher use able capacity. The Red arc BMS enables the camper's batteries to charge to 100%.It's widely accepted that alternators generally charge a vehicle's battery to around 70% and trailer batteries fare even worse,topping out at around 65%. Considering most batteries can only be discharged to 50% this leaves the battery with only 15% of usable charge (65-50=15%) unless supplemented by additional charging resources, particularly for longer stays. In order to safely charge the batteries to 100% charge, the system utilises a multi-stage charger to progressively top up the battery reserves without generating excessive heat. It also controls all incoming charging energy sources (240V, 12V and solar), keeping the batteries primed at 100% charge. This facilitates improved utilisation and prevents overcharging. The BMS's final selling point was its ability to double the battery recharging rate when used with our Honda EU20 generator, which normally provides a recharging rate of 8Ah. With the BMS, the output is more than doubled, rising to 15Ah. This reduces generator running time, fuel costs and the associated noise. All in all, the Red arc BMS is a very impressive bit of kit. While in Adelaide, we stopped in at the Red arc manufacturing facility to see how our units were produced. Red arc is an Australian success story, locally manufacturing quality electrical components and boasting a two year no fuss warranty. I can verify as to the class leading manufacture and quality assurance in the build, as we viewed components tested at varying stages of the manufacturing process. After the tour, we picked up a pure sine wave 1000W inverter(SK1000) to power our 240V electrical devices when away from mains power. These include our laptops, cameras, phones and batteries.While we have used modified sine wave inverters in the past, we have had issues with laptop hard drive failures, so these days prefer the pure sine wave. While they cost a few hundred dollars more, the cost savings are more than recovered simply due to the reduced chance of fatal failures. The boys at Elizabeth AutoElectrics took care of the fitting side of things, mounting the inverter at the bottom of the wardrobe. Very little needed to be done to the interior of the Topaz, such isits high level of comfort from the factory. But to make it more cosy, particularly during the colder months, we laid carpet on the floor. To cool it without resorting to generator power, weinstalled twin Sirocco Caframo 12V fans. These help to circulate the air and a timer system allows them to run overnight. They are an excellent unit and consume very little power (0.21 - 0.34Aheach). We ran high output LED strip lighting along the ceiling, lighting up the interior like a Christmas tree. The output is probably higher than it needs to be, but suits our mobile office needs. It's rumoured that something similar may soon appear on the Topaz production line. To assist with carrying a years worth of clothes and other kit,additional storage pockets were attached to the walls using suction hooks. The pockets have fared well, although they're not rated for heavy items during bumpy off road travel. Everything has its limits! Up front, we prefer the Hitchmaster DO35 drop on coupling, a wide self-centering coupling that guides the locating pin home with ease, making hitching up simple. We just have to remember to keep the pin well lubed to assist in removal, particularly in dusty or sandy conditions. 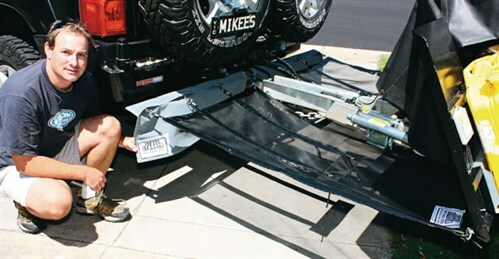 A Vehicle Components hitch lock slides through the coupling, securing the trailer, and a neoprene shin protector minimises swearing on accidental impact. To reduce marital confrontations the VMS Navigation System in the Patrol is supplemented with a dual reversing camera kit and switch box, with cameras fitted to both the Topaz and the Patrol. They area great addition, providing both day and night vision, and greatly reducing stress. Money well spent! We are running 17x8in Patrol alloy wheels on the Topaz, matched to rugged Cooper STT tyres. Combined with the dual spares carried on the Kaymar rear bar, we are carrying nine matched wheels; ensuring three spares are available at any one time. The STTs have performed above expectation to date, clocking up over 20,000km. Along the Gibb River Road the tyres performed superbly, cutting through the loose surface gravel to the sharp embedded gibbers to provide excellent traction. 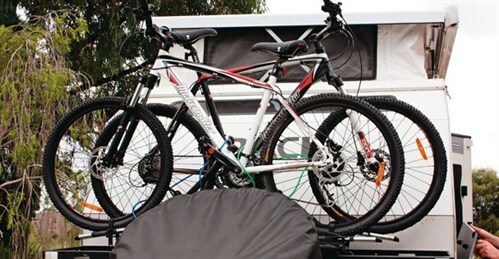 Sitting on the front storage box, a Thule dual bike rack looks after a pair of Malvern Star XCS mountain bikes. Kudos to Thule for building such a well-engineered rack, because despite enduring some of the roughest roads in Australia, the bikes haven't even looked like they are in danger. Arguably some of the credit should be shared by Track Trailer for the way the MC2 suspension massages the corrugations. Taking care of stone protection duties, a Stone Stomper shields there are windows and the Topaz's paintwork. The Stone Stomper utilises a horizontal truck mesh between the vehicle and camper to deflect any flying debris. While we have used a custom made, extended rear wheel flap unit for a number of years, the Stone Stomper is a much better solution, providing improved protection and better appearance, without limiting airflow around the rear diff. In motion, the Stone Stomper also pads down dust, keeping our mountain bikes and the front of the camper relatively clean. When it comes to sharing a barbecue with fellow travellers, our Cross Country 4x4 Stadium Light pumps out 1600 lumens of lightwhilst drawing a mere 1.5Ah. The high output LEDs are mounted on a 3.25m bi-fold light pole, lighting a broad area and keeping the bugs up high instead of around us. Taking care of catering duties, a Sovereign stainless steel hooded barbecue lives in a dedicated locker on the near side of the camper, sliding out for use. While the campfire is the entertaining centrepiece, the barbecue enables fuss-free outdoor cooking. Well folks, that's an insight into how we've setup the Topaz to be our home away from home for the next twelve months or more. To date, all our additions have added value, making an exceptional offroad camper an even better long term touring proposition. I twill be interesting to compare notes at the end of the trip, to see what survives the brutal punishment that is offroad travel.